Sensor Includes a Copper Tip Which Improves Thermal Response Time to 2 Seconds or Less (63% Response Time in Water Flowing at 3 Feet per Second). 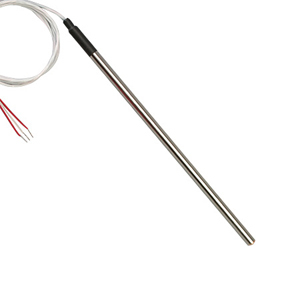 Perfect for Use in Thermowells or as a Direct Immersion Sensor. This sensor incorporates a copper tip which provides an efficient way to thermally connect the sensing element to the process conditions to be measured. This becomes especially important in applications where the sensor has little exposure to the item being measured such as in thermowells and bearing temperatures. The PRTFCU sensor can be customized to function like many of our immersion sensor designs such as the PRTF-10 Immersion Probe, PRTF-13 Quick Disconnect Probes, PRTF-12,14,18 or 19 Spring Loaded Probes with Connection Heads. Standard: Specify "-1/4" or "-3/16" for probe diameter in inches. To order intermediate lengths change model number, using the next longer length for price. Over 24", add $1 per inch of probe length. Metric: Specify "-M60" for 6 mm or "-M45" for 4.5 mm for probe diameter. To order intermediate lengths change model number, using the next longer length for price. Over 600 mm, add $1 per 25 mm of probe length. All: To order with shrink tube strain relief, specify "-ST" at the end of the model number. Probes supplied 3-wire standard, 2 and 4-wire may be ordered, consult Sales department for price and availability. Order male and female connector separately to create pairs.